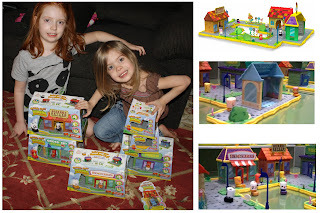 Bobble Bots Moshi Review <-- FUN! Are your kids a fan of Hexbugs or do they like robotic type toys? If so, you won't want to miss out on Bobble Bots Moshi Monsters! They are made with high-tech vibration technology with playsets that can be built how your child wants it to be built. The little power houses also come in cute collectible designs such as DJ Quack, Coolio, Honey and many more. What is really neat about the Bobble Bots was my girls were coming to get me every time a commercial was on for them telling me they wanted them so when the opportunity came about to host a Bobble Bots Moshi Party, I couldn't resist. This is our introduction to Bobble Bots as soon as we received them. They were "tested" out before the party because as good hosts, we had to be able to really show how much fun they are! This was not a problem for them! These were so much fun and the girls went crazy playing with them. We had hoped to have a bigger party but we ended up moving sooner than expected and will be using these with our big birthday party we will be having in a couple of weeks. The playsets were easy to put together and since they are in pieces, it makes for easier storage. The small yellow clips keep the Bobble Bots in their areas. They can swoop in and out of doors, bump into each other but they keep going! Check out our video but please note that we didn't fasten one of the roof's down so it was bumped off slightly. Which Bobble Bots is your favorite? Bobble Bots were made from the creators of HEXBUG and launched this spring. Innovation First International teamed up with Mind Candy to introduce these fun robotic pets. Disclosure: I received the Bobble Bots Moshi Monsters sets from Mommy Party in exchange for this post. All opinions are 100% my own.